The Walt Disney Animation Studios may have done it again, but no, they’re still not Pixar. Yet, it’s hard not to give them credit for the way they’ve reinvented themselves in the 10 years or so since they embraced computer animation. While Zootopia does follow familiar narrative tropes, it may be the most thematically bold and accomplished film of the studio’s new era. When you think of Disney, you expect princesses and cute animals, not a fine parable on multiculturalism and race relations, which their new film surprisingly delivers—even if it does focus on cute animals, such as Judy Hopps (Ginnifer Goodwin), the first rabbit police officer in an entirely animal-populated Zootopia. 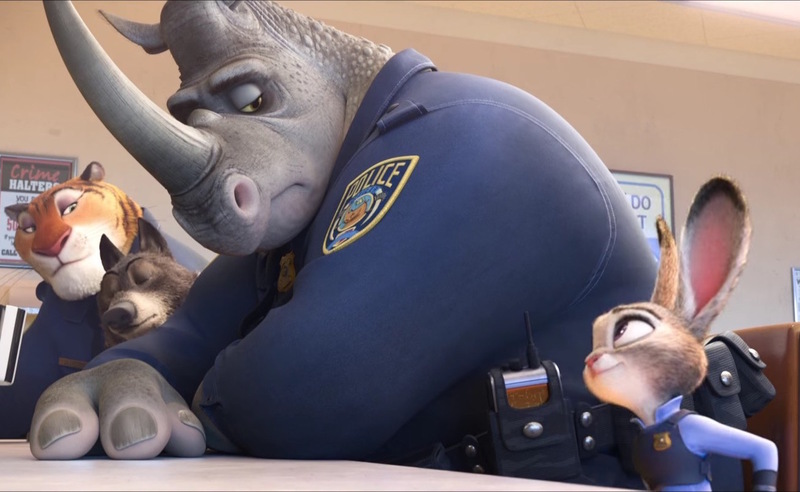 Judy Hopps will have to face discrimination and prove her worth as the first rabbit police officer in Zootopia. Although you may have to think twice about calling her “cute”—rabbits can call each other that, but other animals shouldn’t. You get the idea—with so many species living side by side, most of them carrying some form of prejudice, things are bound to get ugly. Not ugly enough for them to eat each other—predators and prey seem to have achieved some sort of harmony in that regard—but an elephant might refuse to serve a fox in an ice cream store, because everyone knows foxes are up to no good. Case in point: Nick Wilde (Jason Bateman), a smart-mouthed but utterly charming con artist fox who Hopps will have to team up with to investigate a series of mysterious disappearances across the city. Having two seemingly incompatible beings—rabbits and foxes are natural enemies—work together to solve a crime despite their differences, predictably becoming the best of friends in the process, makes Zootopia a model buddy cop comedy. The plot is straight out of the ‘80s—it’s hard not to think of 48 Hrs.—but its timely social commentary makes it unfit for any other decade than our own. You may choose to read very closely into the film’s allusions and metaphors, in which case you might be disappointed to find some questions are left unaddressed—namely, what do predators have for lunch, and why are there no interspecies couples?—or you may enjoy the film for its wonderful comedy timing and engrossing world. If there’s a criticism to be made, it’s that for the many wonderful touches that make Zootopia so pleasurable, screenwriters have also recycled a device that has grown increasingly tiresome. Has Disney retired its career baddies? Sorry for the spoiler, but this is the studio’s fourth animated film in a row to use a plot twist in which a positive character is unmasked as the main villain, and by now all it deserves is an eye roll. For the most part, the film truly works by presenting you with an unusual world you’d actually want to explore. There have been many other fictional metropolises in animated films, many variations of that archetypal “big city”—Monstropolis in Monsters, Inc., Robot City in Robots or an unnamed insect-populated town in A Bug’s Life—but none as cleverly detailed as Zootopia, which lends its name to the film mostly because the city itself often outshines the characters. Which isn’t to say anything bad about the characters—they’re the ones that make it all come alive, and through them, the film achieves a delicate balance between stereotype and self-determination. Are you ever justified in expecting a rabbit or a fox to behave as such? Films aimed at children typically offer easy answers to complicated questions, but this one is so contagiously optimistic it might just get a pass.